For Too Many People Home Improvement Winds Up an Exercise in Unintended Home Demolition. It Doesn’t Have to Be that Way! 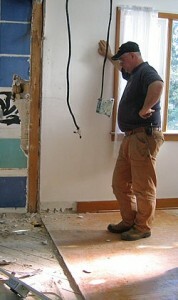 Sure, we’ve all been there; the renovation project from hell. The home improvement plan that started as a small little fix-it-up that grew into the blob thing from that old Steve McQueen Movie. Your don't have to end up like this guy. You can avoid all that and still make beautiful and charming improvements to your home. All you need is the top information and the best products for getting the job done. That’s what this blog is here to provide. I’m going to be your life line in the sea of home improvement projects in danger of being lost at sea. In the posts to come I’m going to cover it all. From how to make a shed, building a closet and do it yourself kitchen cabinets to home organization ideas, decorative painting ideas, calculating costs and screening craftsmen. There’ll be loads of DIY suggestions, plenty of product reviews and regular top 10 lists, so you can be confident you’re using the best tools to get the job done. Your home is not just your single largest investment of your hard earned money, it’s also a statement about you. Some people are content to make theirs the coziest most comfortable little abode of their dreams. For others, their home is a kind of work of art; colors, the use of space and material, lighting all factor in to create an effect that gives expression to their creativity. Whatever you want for your home, the best way to achieve it is to be informed. That’s why I’m here. At the end of the day, my job is clear, to bring out your inner home improvement rockstar!